The Finnish top-level domain celebrates 25th anniversary and the number of applications keeps growing. 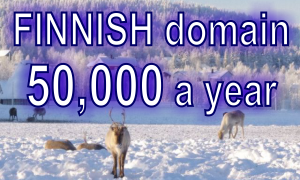 The demand for Finnish domain names are approximately 50,000 a year. Up to date, the number of valid .FI domain names has reached almost 300,000 and is expected to grow vigorously in the coming years. Initiated in 1997, the number of .FI domain names increased 40-fold during the last 25 years going from 7,000 initially to over 280,000 today. Thanks to the Domain Name Act of 2003, the scope of domain names available to applicants has expanded. It coupled with the introduction of an automated domain name service and abandonment of the preliminary examination of domain name applications by the Finnish domain name authority. These reforms resulted in doubling the number of Finnish domain names. There were approximately 75,000 domain names registered by the end of 2003. The year 2006 marked the beginning of registration of .FI domain names by private persons. The number of approved applications for Finnish domains has been quickly increasing during the late 2000’s. The Finnish domain name authority granted 36,000 domain names in 2006 whereas in 2010 the figure rose to over 47,000. Currently, out of nearly 300,000 Finnish domain names, about 13 percent are held by private individuals, whereas 80 percent have been reserved for organizations. The .FI – the national top-level domain – has established its position as a Finnish and trustworthy address on the internet. The Finnish domain registration authority has introduced an improved service for .FI domain names which reinforces information security. The main feature of the improved .FI domain name service is the DNSSEC (Domain Name System Security Extension) which enhances the information security of the name service. DNSSEC secures the integrity and origin of information as it makes sure that replies to name service queries are sent by the correct sender and that the response information has not been altered. The improvements to the Finnish domain name services take into account the new technological requirements for electronic services. The service also fully supports IPv6 connections which are believed to grow substantially in the future. It is crucial in view of available IPv4 addresses no longer being assigned. The IP (Internet Protocol) is a communication protocol at the network layer which makes it possible for the devices connected to the internet to communicate with one another. To register a Finnish domain name, contact Web Solutions – a global leader in domain registration providing Local Trustee Service. An experienced team of consultants will take you step by step through a registration process and answer any questions you might have regarding application for a Finnish domain name.